Economic growth was robust among developing economies in Q1 due to a combination of higher commodity prices, strong global growth and largely accommodative financial conditions. Advanced economies, however, appear to have hit a slowdown in Q1. A more complete GDP dataset showed that the global economy expanded 3.5% annually in Q1, matching last month’s estimate and coming in a notch above the 3.4% rise recorded in Q4 2017. Weaker economic sentiment and a strong currency led GDP growth to decelerate in the Eurozone in Q1. While more recent indicators corroborate that the Euro area economy is in a soft patch, political developments have taken center stage in recent months. In Italy, designated Prime Minister Giuseppe Conte resigned on 27 May, before he could be sworn in. President Sergio Mattarella had vetoed the appointment of an anti-euro Minister of Economy and Finances, triggering Conte’s resignation, along with those of his proposed cabinet. While President Mattarella reacted quickly and designated Carlo Cottarelli as a caretaker prime minister, the situation could rapidly deteriorate, as Cottarelli does not have enough support in parliament, and a confidence vote could prompt a new election as early as September. In Spain, corruption convictions affecting the ruling Popular Party (PP) prompted the Socialist party to call for a no-confidence vote, to be held on 1 June. That said, there is little chance that opposition leader Pedro Sánchez will become the new president, as he is failing to gather enough support in Spain’s highly fragmented parliament. In Japan, the economy performed poorly in Q1 due to a combination of bad weather and sluggish wage growth, which put a dent in household consumption. Moreover, export growth weakened in the same period, fueling concerns that the global tech cycle has finally peaked. While investment also deteriorated in Q1, analysts expect that capital expenditure will be revised upward in the second estimate due on 8 June. Comprehensive data for the UK, meanwhile, confirmed that the economy started the year on a weak note, partly due to adverse weather conditions and pessimistic consumer sentiment. Economic data for Q2 suggests that the global economy is at the peak of the cycle and that growth will likely slow in the second half of the year. Unemployment is gradually reaching pre-crisis rates, with some economies reaching full employment. A booming U.S. economy is forcing the Federal Reserve to deepen its tightening cycle, threatening to squeeze global financial markets in a context of high private and public debt levels worldwide. That said, low global inflation levels will allow other key central banks to maintain their loose monetary policy stances. While recent fiscal stimulus measures in the U.S. could help spur global growth in the short-term, the consequences in the long-term could materialize in the form of higher current account and fiscal deficits in the United States. Moreover, recent measures to limit trade flows could seriously harm global trade, one of the main growth engines in recent years. While higher oil prices will help oil-export-driven economies recover following years of harsh austerity, the global economy will suffer from it, as higher oil prices will boost inflation and erode households’ purchasing power. Despite mounting economic and political threats, our analysts are still positive about the outlook for the global economy. They project that global growth will reach 3.5% in Q2. While economic growth slowed in Q1 in some advanced economies, analysts expect that the shock will be only temporary and that global growth will remain resilient further down the road. This year, FocusEconomics panelists left their growth estimates for the global economy unchanged at 3.4% for the third consecutive month. If confirmed, this would represent the strongest rate in seven years. In 2019, the global economy is expected to expand at a broadly steady rate of 3.3%. This month’s stable outlook for the global economy reflects unchanged growth prospects for the Euro area. The economies of Japan and the United Kingdom received a downgrade this month due to a poor start to the year. Conversely, the economic outlooks for Canada and the United States were upgraded this month. The economic story in emerging markets remains broadly unchanged, although some warning signs have started to emerge. Strong dynamics in China and India continue to shore up growth in the Asia (ex-Japan) region. That said, a fear that the global export cycle has already peaked, coupled with a potential rise in trade protectionism, could derail an otherwise stellar growth trajectory. A slowdown in the Eurozone, increased geopolitical noise in Russia and unsustainable economic stimulus in some countries such as Romania and Turkey are threatening growth in Eastern Europe. While higher commodity prices bode well for most countries in Latin America, political instability, particularly in Brazil, and economic woes in Argentina are exerting downward pressure on the region’s economic outlook. Similarly, mounting geopolitical risks and large economic imbalances are holding back many countries in the Middle East and North Africa, and Sub-Saharan Africa regions from taking advantage of the recent increase in key commodity prices. An ever-tighter labor market is likely to fuel a stronger economic performance in the second quarter, following a moderation of seasonally-adjusted annualized growth in the first quarter. In April, the unemployment rate was at its lowest since the dot-com bubble peak in 2000. This will likely bolster wage growth; simultaneously, the recent tax reform should start producing effects, boosting after-tax household incomes. Together, these dynamics should support higher consumer spending, so far reflected in robust retail sales growth and buoyant consumer confidence in April. Nevertheless, survey data for the same month suggests an incoming slowdown in the manufacturing sector, amid heightened uncertainty caused by the country’s ongoing trade dispute with China. On 28 May, the White House announced its plan to move forward with 25% tariffs on USD 50 billion of Chinese imports, as well as further restrictions on Chinese investment to be unveiled on 30 June. However, this position could evolve quickly as trade negotiations continue. A possible escalation of trade tensions with China is threatening to cool otherwise strong business sentiment and investment momentum. Furthermore, the ongoing monetary policy tightening could hurt households and dampen consumption growth, given the high amounts of existing consumer debt. Looking further ahead, a widening fiscal deficit is one of the main threats to the country’s economic outlook in the medium term. 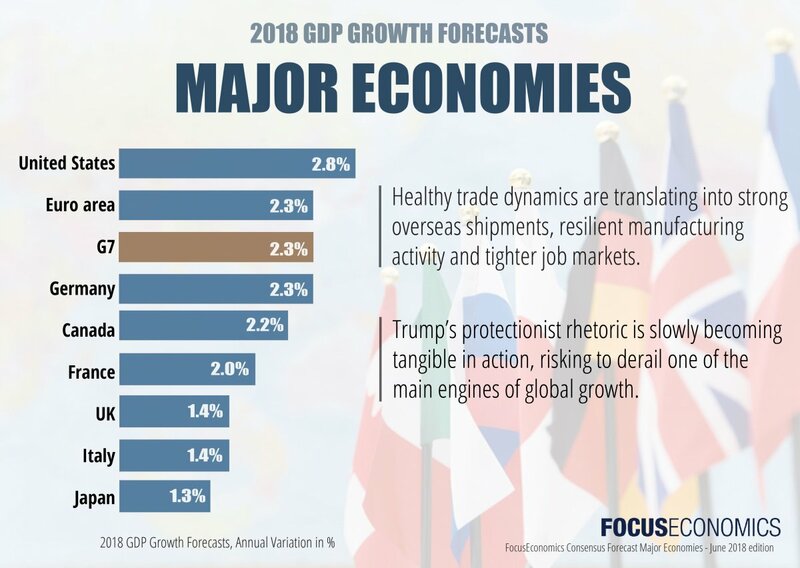 FocusEconomics panelists see GDP expanding 2.8% in 2018, up 0.1 percentage points from last month’s estimate. In 2019, growth is seen moderating to 2.4%. The Eurozone economy lost steam in the first quarter of 2018, starting the year off on a subdued note following a stellar 2017. Growth slid to the lowest rate since Q3 2016, likely weighed down by a strong euro and weaker sentiment as well as several one-off factors such as the early timing of Easter. Available data for the second quarter suggests that growth remained at a slower cruising speed: Economic sentiment rested at March’s six-month low in April, and the composite PMI fell to an 18-month low in May. In the political arena, recent developments have also not been so sunny. In Italy, anti-establishment parties, the League and the Five Star Movement, abandoned plans to form a government on 27 May, after the Italian president blocked the nomination of a Eurosceptic finance minister, increasing the chance of early elections. Political uncertainty has also risen rapidly in Spain, and the government will reportedly face a no confidence vote in the coming days on the heels of a large corruption scandal. FocusEconomics panelists held their view of the Eurozone economy unchanged this month and see GDP growing 2.3% in 2018. A solid labor market and robust investment should support healthy, albeit slower, growth this year. Political risks, however, continue to cloud the economy’s outlook, while slowing exports will take some wind out of the recovery. In 2019, the economy is seen expanding 1.9%. The economy lost steam in the first quarter as private consumption was negatively affected by bad weather and sluggish wage growth. While investment performed poorly in Q1, more complete data to be released on 8 June is expected to deliver a more positive picture. Exports also weakened at the outset of the year, suggesting that the global tech cycle may have peaked in Q1. While growth is expected to rebound in Q2, data for the quarter so far signals that the improvement could be limited. Consumer confidence fell in April as a historically-low unemployment rate is failing to translate into substantive wage gains. The manufacturing PMI fell to a nine-month low in May due to soft demand pressures. On the flip side, a weak yen could boost exports, therefore spurring manufacturing activity. A tight labor market, the Bank of Japan’s (BoJ) ultra-loose monetary policy and renewed fiscal support are shoring up economic growth this year. Higher energy prices and weaker export growth will, however, reduce the contribution of the external sector to overall growth. The main downside risk is an increase in geopolitical tensions, which would lead to an appreciation of the yen. FocusEconomics panelists see the economy growing 1.2% in 2018, which is down 0.1 percentage points from last month’s forecast, and 1.0% in 2019. GDP growth was confirmed at a mere 0.1% in the first quarter, a multi-year low, on slower private consumption growth and contractions in business investment and exports. However, the reading could be partly due to temporary factors—such as severe weather and the collapse of construction company Carillion. Other indicators painted a more positive picture of the quarter: Employment surged, lifting the participation rate to a record high, while real wages grew again following four consecutive quarterly declines. The economy has started Q2 in mixed fashion. In April, the services and manufacturing PMIs were fairly subdued—despite remaining in positive territory—with the services sector bouncing back less than expected from March’s weather-induced dip. However, in the same month government borrowing was the lowest since 2008. This came after the budget deficit shrank markedly last year and will likely give the government slightly more room to boost spending on cash-strapped public services. Growth going forward will likely remain mediocre, with fixed investment dampened by Brexit uncertainty and export growth slowing after the boost provided last year by the weaker pound. However, a pick-up in government spending and a loose monetary stance will support the economy. Our panelists estimate GDP growth of 1.4% in 2018, down 0.1 percentage points from last month’s forecast, and 1.5% in 2019. Price pressures remain soft globally despite the recent surge in some commodity prices, particularly for oil and oil-related products, driving global inflation down from 2.6% in March to 2.4% in April. April’s print represented the lowest reading in nine months and mostly reflected lower inflationary pressures in Canada, China, the Euro area, Japan and the United Kingdom. With inflation remaining well below the central banks’ targets in the Eurozone and Japan, our panel of analysts expect the European Central Bank and the Bank of Japan to keep their ultra-loose monetary policies unchanged at least until the end of Q1 2019. On the flip side, price pressures continue to rise in the United States, with inflation hitting an over one-year high in April. Strong price pressures in the world’s largest economy, coupled with robust economic dynamics, are leading a majority of our analysts to project four interest rate hikes of 25 basis points this year. Higher commodity prices, particularly for energy and food, are expected to drive up inflation in the coming months. The FocusEconomics panel sees global inflation at 2.8% for 2018, which is unchanged from last month’s estimate. Next year, the panel projects that inflation will remain broadly stable at 2.7%. If the hyperinflation episode in Venezuela is factored in, global inflation will reach 115% in 2018 and 9.1% in 2019.